Imagine calling up Microsoft Tech Support Line and asking for help regarding your FreeBSD server! Too much? Well, that just happened. On June 8, 2016, Microsoft announced the availability of FreeBSD 10.3 as a ready-made VM image available directly from the Azure Marketplace. It means that like every other VM images in Azure, Microsoft created its own FreeBSD image. This also means that not only can you quickly bring-up a FreeBSD VM in Azure, but also that in the event you need technical support, Microsoft support engineers can assist. This is after their big announcement regarding bash on Windows 10. If you have Azure access, it’s very easy to create a VM. Login to your Azure portal and simply click on the +New on the left pane (or the marketplace tile on your dashboard), type “FreeBSD” in the search text box and follow the on-screen wizard. FreeBSD 10.3 for Microsoft Azure provided by Microsoft. FreeBSD is an advanced computer operating system used to power modern servers, desktops and embedded platforms. The FreeBSD Logo and the mark FreeBSD are registered trademarks of The FreeBSD Foundation and are used by Microsoft with the permission of The FreeBSD Foundation. 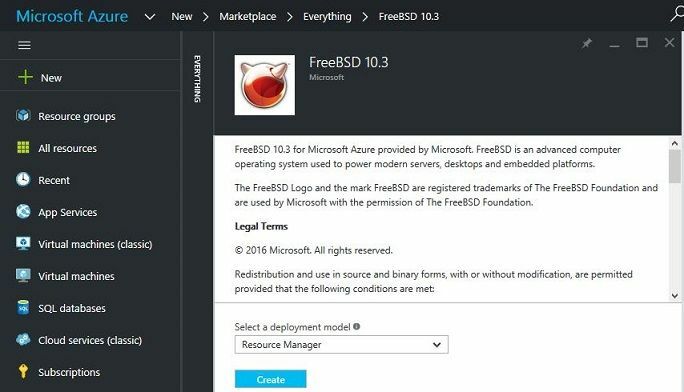 “It’s quite a significant milestone for FreeBSD community and for Microsoft to publish a supported FreeBSD image on Azure Marketplace. We really appreciate Microsoft’s commitment and investment in FreeBSD project”. Jason Anderson, principal PM manager at Microsoft’s Open Source Technology Center says Redmond “took on the work of building, testing, releasing and maintaining the image” so it could “ensure our customers have an enterprise SLA for their FreeBSD VMs running in Azure”. In addition, we have added the Azure VM Guest Agent, which is responsible for communication between the FreeBSD VM and the Azure Fabric for operations such as provisioning the VM on first use (user name, password, hostname, etc) as well as enabling functionality for selective VM Extensions. For more information, visit Microsoft’s blog. In case this are all news to you, Microsoft has been supporting Linux and Open Source products for some time now. The following table lists the Linux distributions and versions that are supported on Azure. The Linux Integration Services (LIS) drivers for Hyper-V and Azure are kernel modules that Microsoft contributes directly to the upstream Linux kernel. The LIS drivers are either built into the distribution’s kernel by default, or for older RHEL/CentOS-based distributions are available as a separate download here. Please see this article for more information about the LIS drivers. The Azure Linux Agent is already pre-installed on the Azure Gallery images and are typically available from the distribution’s package repository. Source code can be found on GitHub. What do you think about this news? I think Linux and Open Source is becoming big enough for big players like Microsoft, Oracle to jump in and officially supporting it. Good for us those who works on open source environment. So yeah, why not.. bring it on.